My boyfriend loves bear claws, so I attempted to make some for him. These bear claws are filled with almond paste and sprinkled with sliced almonds and icing. They came out very good, and he ate most of them before I could give them away to my friends. This recipe (below) is pretty simple and easy. Enjoy making them! In a bowl, toss butter with 3 cups flour until well coated; refrigerate. In a large bowl, combine yeast and remaining flour. In a saucepan, heat cream, sugar and salt to 120°-130°. Add to yeast mixture with 1 egg. Beat until smooth. Stir in butter mixture just until moistened. Place dough onto a well floured surface; roll into a 21-in. x 12-in. rectangle. Starting at a short side, fold dough in thirds, forming a 12-in. x 7-in. rectangle. Give dough a quarter turn; roll into a 21-in. x 12-in. rectangle. Fold into thirds, starting with a short side. Repeat, flouring surface as needed. (Do not chill dough between each rolling and folding.) Cover and chill for 4 to 24 hours or until firm. For filling, in a small bowl, beat egg white until foamy. Gradually add confectioners' sugar and almond paste; beat until smooth. Cut dough in half widthwise. Roll each portion into a 12-in. square; cut each square into three 12-in. x 4-in. strips. Spread about 2 tablespoons filling down center of each strip. Fold long edges together; seal edges and ends. Cut into three pieces. Place on greased baking sheets with folded edge facing away from you. With scissors, cut strips four times to within 1/2 in. of folded edge; separate slightly. Repeat with remaining dough and filling. Cover and let rise in a warm place until doubled, about 1 hour. Lightly beat 1 tablespoon of water and remaining egg yolk; brush over dough. Sprinkle with almonds. Bake at 375° for 15 minutes or until golden brown. Remove from pans to wire racks to cool. Place 2 cups powdered sugar with 1 tablespoon of milk in a bowl and mix well. Drizzle over bear claws. My boyfriend and I visited a burger restaurant similar to the Red Robin chain in Southern California last week. It was Slater's 50/50. They are most famous for their half ground beef and half ground bacon burgers. You could also completely make your own burgers and customize it to your specific likes, which we both ended up doing. I made a fiery beef burger with chipotle mayo and roasted green chilies. It was definitely spicy, which I loved! My boyfriend made the 50/50 burger, half ground bacon and half ground beef. He added onion strings, blue cheese, and bacon to top it off. There were both delicious!!! I hope to come back to Slater's 50/50 soon, because we didn't get to try their famous sweet potato fries! A fruit tart is all you need to feel refresh during Spring time. These fruit tarts have an unshrinkable tart shell and delicious pastry cream. Each decorated with fruits such as strawberries, blackberries, mango, and kiwi. To make dough: Pulse the flour, sugar and salt together in the bowl of a food processor. Scatter the pieces of butter over the dry ingredients and pulse until the butter is coarsely cut in. (You’re looking for some pieces the size of oatmeal flakes and some the size of peas.) Stir the yolk, just to break it up, and add it a little at a time, pulsing after each addition. When the egg is in, process in long pulses–about 10 seconds each–until the dough, which will look granular soon after the egg is added, forms clumps and curds. Just before you reach this stage, the sound of the machine working the dough will change–heads up. Turn the dough out onto a work surface and, very lightly and sparingly, knead the dough just to incorporate any dry ingredients that might have escaped mixing. Chill the dough, wrapped in plastic, for about 2 hours before rolling. To make cream: In the bowl of an electric mixer fitted with the paddle attachment, beat the egg yolks and sugar on medium-high speed for 4 minutes, or until very thick. Reduce to low speed, and add the cornstarch. To roll the dough: Butter a 9-inch fluted tart pan with a removable bottom. Roll out chilled dough on floured sheet of parchment paper to 12-inch round, lifting and turning dough occasionally to free from paper. (Alternately, you can roll this out between two pieces of plastic, though flour the dough a bit anyway.) Using paper as aid, turn dough into 9-inch-diameter tart pan with removable bottom; peel off paper. Seal any cracks in dough. Trim overhang to 1/2 inch. Fold overhang in, making double-thick sides. Pierce crust all over with fork. Line the tart shells with a piece of buttered aluminum foil, butter side down, and fill them with dried beans or rice. Bake for 10 minutes. Remove the beans and foil, prick the bottom of the shells all over with a fork, and bake for another 15 to 20 minutes until lightly browned. Set aside to cool. Before serving, fill the tart shells with the pastry cream. Arrange the berries decoratively on top of the cream. is done when it is firm but the middle may still look a little wet. 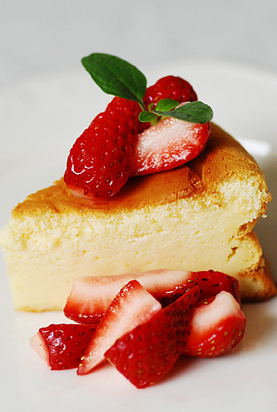 if the cheesecake sticks to the sides as it cools. 350 degrees F (177 degrees C) with rack in center of oven. incorporated. Remove the crust from the refrigerator and pour in the filling. Place the cheesecake pan on a larger baking pan and place in the oven. (helps prevent the surface from cracking as it cools). from heat. In a blender, puree about 1/3 of sauce, then mix back into remainder. uncovered, until firm. Then wrap in aluminum foil and place in a freezer bag. cheesecake in the refrigerator overnight.